There's a reason so many people love kettlebell training — after all, who doesn't want a total-body resistance and cardio workout that only takes half an hour? And even more surprising, an American Council on Exercise (ACE) study recently found that the average person can burn 400 calories in just 20 minutes with a kettlebell. That's an amazing 20 calories a minute, or the equivalent of running a six-minute mile! What makes the workout so effective, especially when compared with traditional weights like barbells or dumbbells? "You're moving in different planes of movement," says Laura Wilson, director of programming for KettleWorX. "Instead of just going up and down, you're going to move side to side and in and out, so it's much more functional. It's like you move in real life: kettlebells simulate that movement, unlike a dumbbell." As a result, Laura says, you end up using more of your stabilizer muscles than traditional weight training, which translates into an increased calorie burn and a killer workout for your core. All this makes kettlebell training not only great for weight loss but also for improving fitness level: an ACE study found that eight weeks of kettlebell training two times a week improved aerobic capacity by almost 14 percent and abdominal strength by 70 percent in the participants. "You're recruiting so many more muscles than you would with traditional training," Laura explains. If you're ready to jump on the kettlebell train, don't just grab a weight and start swinging. 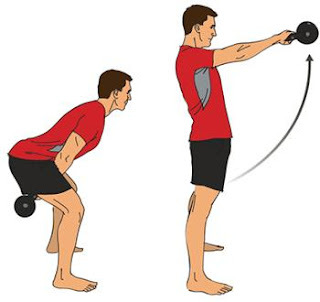 Proper form is essential for ensuring you stay injury-free when performing kettlebell exercises. Start with light kettlebells, and visit a certified kettlebell trainer (check your gym to see if classes are offered) to learn the right way to train — then check out our kettlebell exercises below!